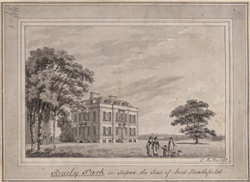 View of the mansion at Heathfield Park, originally called Bayley Park . An original red-brick mansion was built here in 1677-82 for James Plummer, a London merchant, but by the date of this picture,the house had been remodelled by Sir Robert Taylor. The owner at this time was General Elliott, an officer who had been second in command at the capture of Havana in Cuba, and who bought the estate with his pay for the achievement. He was granted the title of Lord Heathfield after successfully commanding the defence of Gibraltar against the Spanish siege in 1779-82. A drawing of the same house, from 1794 by Humphrey Repton, shows the mansion clad in fashionable stucco and with triangular pediments added to the roof.